Starting with version 2.02, the network authorization of the HYDRUS program cannot be done as in previous versions (using the Activation) but requires a Hardware Key (NetHASP). HASP is a software copy protection device that plugs into the USB port of the computer. NetHASP is a HASP key designed for networks, i.e. instead of connecting a HASP key to each station, you connect one NetHASP key that serves the entire network. Since the HYDRUS network authorization is enabled by NetHASP, HYDRUS can be installed on each network computer in the same way as on any other stand-alone computer (i.e. 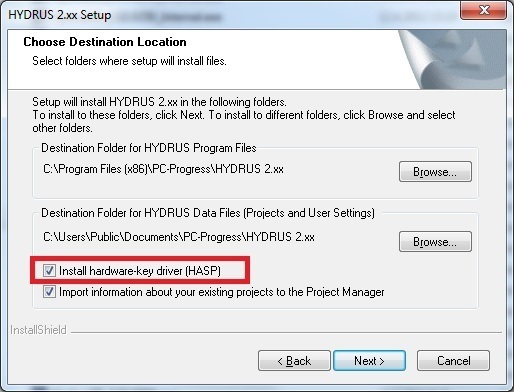 HYDRUS program files can be located on a local drive of the computer). If you need to make a network installation of HYDRUS 2.01, please follow instructions Network installation of HYDRUS version 2.01. The installation program of the latest version of HYDRUS 2.x is available in ELIS. All customers, who purchased a license for version 2.x, have received login information for their account in ELIS. HYDRUS installation program (about 120 MB) is a self-extracting file, created in InstallShield (for example Hydrus3D_2.02.0640.exe). Once you double-click on it, it will automatically unpack into a temporary directory and start running Setup. Follow the instructions provided by SetUp. Check the "Install the hardware-key driver" check-box (see the picture below). At the end of the installation process, check the "Launch HYDRUS" check-box, which will start HYDRUS. This step is important especially on newer Windows systems for finishing the installation successfully. Without authorization HYDRUS works as a demo version (it works as a regular program, but with calculation and saving of data disabled). You can look at inputs and results of several examples included in the installation. Plug your HASP (that you received from PC-Progress) into the computer (or to a computer on your LAN), which will authorize HYDRUS.